I’m dedicating this recipe to Noah, our friends’ 15 year old son. He’s their devoted steak-frites eldest son and he announced last month that he’s gone veggie. Right on Noah! Bring it on. This recipe is for you – it’s easy, fresh, quick, healthy, and delicious. A recipe every 15 year old should have in their repertoire. And, for the rest of you, when you hear someone say “I could never do that, I like steak too much,” tell them about Noah. If he can do it, anybody can. Cook rice noodles in a large pot of boiling water until just tender, then drain in a colander and rinse under cold water until cool. Meanwhile, mix together soy sauce, vinegar, oil, red pepper flakes, garlic, and ginger. 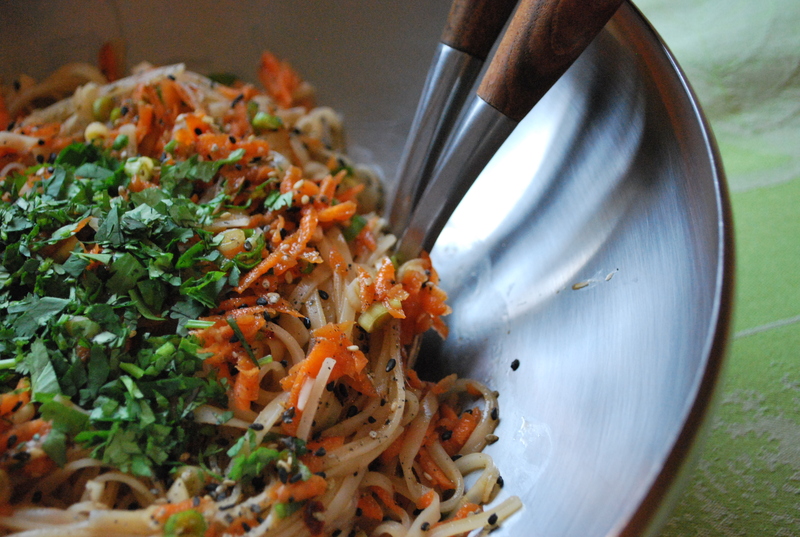 Toss noodles with dressing, carrot, scallions, sesame seeds, and cilantro in a large bowl. Garnish with a little extra cilantro and serve. In a word, fabulous — but don’t try it lukewarm. Noah was disgusted when I tried to pass it off as a stir fry. Best to follow your directions and make is real salad, cold and all. I guess I was just keen to see the summer patio lunches arrive and made it tonight, still warm. I added Frank’s Chili-Lime Hot Sauce because I didn’t have any pepper flakes handy… loved it! Oh, and yes, we loved your shout-out to Noah and his veggie-dom. High fives all around! But to clarify, he didn’t think the noodles were disgusting — only my sorry effort to make it a hot dish and to add tofu 🙂 Lesson learned.